Move Over Starbucks, Chabad Café is Coming An array of fresh tea leaves and the smell of rich coffee beans fills the room of The French Press Coffee Roasters, a new café inside the Rutgers Chabad House, a center for Jewish student life on campus. Regardless of the location, the café is open to everyone, saidLee Levinson, the café manager. “Students, non-students, Jews, non-Jews, everyone is more than welcome to come in,” he said. 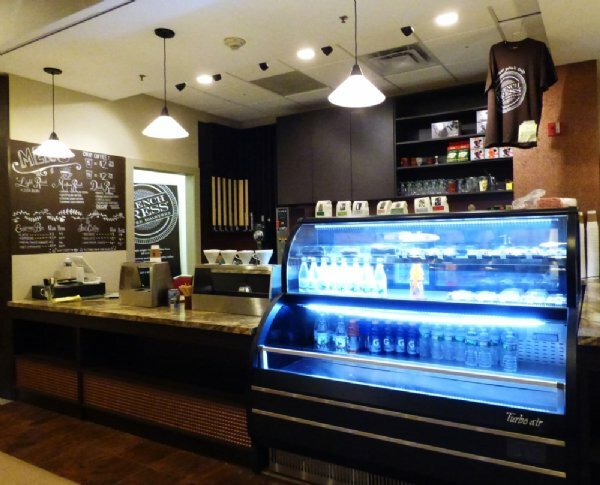 The café was placed in the Chabad House for its location in the middle of the College Avenue campus and in order to reach as many students as possible and expose them to good coffee, Levinson said. It is open from 9 a.m. to 6 p.m. Monday through Thursday, and 9 a.m. to 4 p.m. on Fridays. They do not plan on actively competing with the other popular cafés on College Avenue, such as Au Bon Pain. What differentiates The French Press coffee involves the entire process of how it is made, Levinson said. There are about 10 to 15 variations of coffee from around the world on any given day, he said. Lattes, cappuccinos, teas, iced coffee and more are also available. Micah Liebowitz, a School of Arts and Sciences sophomore and Chabad House resident, said he is not a big coffee drinker, but the café has other options like sushi, which is hard to find around campus. The vibe the café gives off is different, Liebowitz said. He described the “vibe” as unique and hipster. There is also a quiet area for students to study and enjoy free Wi-Fi. Many people wonder what the Chabad House is, and this café offers an opportunity for people to come in and find out, he said. Usually the same groups of people can be seen on a regular basis at the Chabad House, but since the coffee shop opened, Liebowtiz said there have new faces. “We want people to know that we are here and to walk through and give us a shot,” he said. Amy Noor, a School of Arts and Sciences junior, said it can be intimidating to enter a residential building on campus when one is not affiliated with it. “But I believe it’s a great idea because it allows intermingling and exposure among different student groups,” she said.